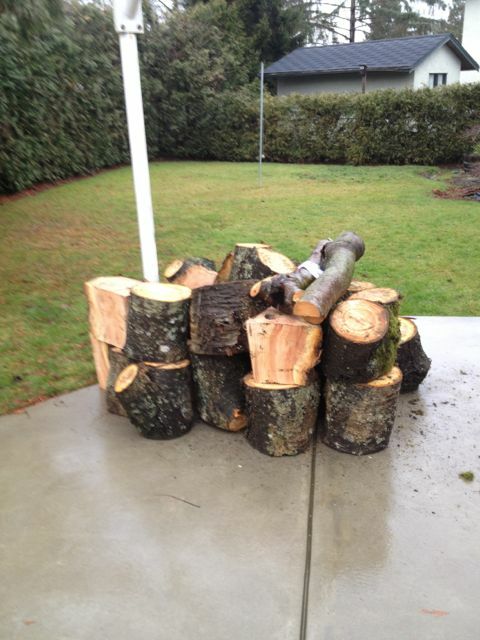 On Dec 18th I happened to drive by a property where Arborists were in the process of removing a large Cherry tree. I stopped to ask if I might get some wood to turn and was told that a neighbour had already asked if he could have the tree for firewood. I met with the neighbour and he agreed that I could take as much wood as I wanted especially if it was ‘squirrely’ which would be hard for him to split for fire wood anyway. I spent a few hours with the Arborists and took home a real bonanza. I wound up with a little more than I will probably get to use so if there are any wood turners reading this post who would like a section of a crotch or other piece to turn please leave me a message. Several weeks ago I was contacted by the South Delta Leader enquiring if I would be willing to be interviewed for a small article in the paper. This sounded really great, any time I can get some press has got to be good. Shortly after I agreed, a reporter (Christine Lyons) along with a photographer (Tyler Garnham) visited me in my studio and work shop. Here is a link to the article that was published. Or if you’d rather see the complete article in PDF format, check this out.